I’m not in the habit of shopping for dolls or conjuring up theories about the nature of beauty. But walking through Shoprite the other day, a discount retailer down the road from our home (think little Wal-Mart but cheaper and more crowded), I couldn’t help but notice something peculiar in one of the aisles. 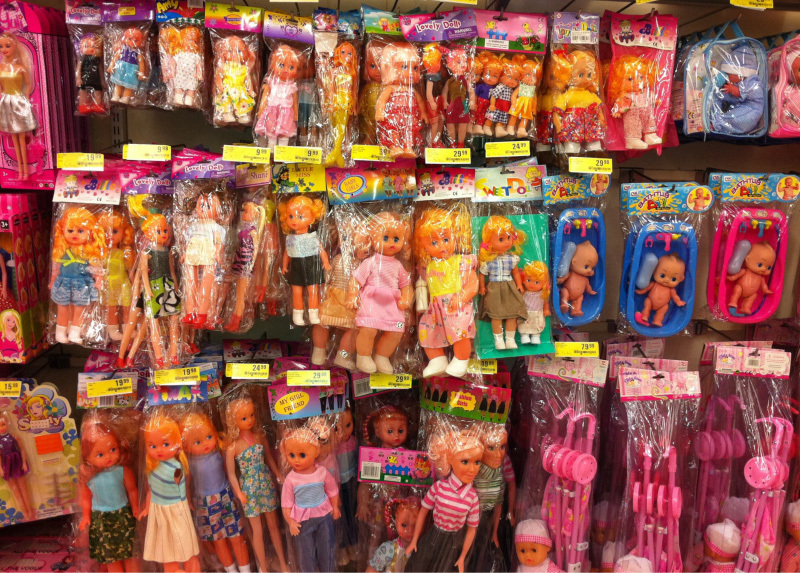 All around me in the store were black people, but staring back at me from the shelves of this one aisle was a phalanx of dolls, all of them white. I’d like to call it peculiar, but truth be told I’ve walked down aisles like that a hundred times before and never stopped to think. Perhaps being in a country where 79% of the population is black made the contrast stark enough for me to wake up and take notice. But what if the thing we call “beauty” has been given a very particular face all our lives? What if that face is found smiling back at us constantly in glossy magazines, on TV and the internet and billboards on high? In the landmark 1947 Doll Test measuring segregation’s effects on African-American children in the run-up to Brown v. Board of Education, psychologists Kenneth and Mamie Clark asked black children to choose between a white doll and a doll painted brown (there were no brown ones to be found) in response to a series of questions about beauty and the like. You can guess the results. And there’s the rub, I think: we know that beauty, smartness, etc. are not nearly as superficial as a particular tone of skin or shade of hair or eyes. And virtue and truth are less superficial still. But we humans are an impressionable lot, especially our kids, so when we fill our TV screens and mobile screenshots and magazine stands and all the rest with a particular image of beauty (and virtue and truth), it starts to sink in. What’s more, when that image consistently looks like one group of people (whites) and not another (people of color), that reinforces a damning set of racial hierarchies that have bedeviled our world far too long. Who can blame the little black girl for thinking her likeness ugly, bad, and stupid and the little white face pretty, good, and smart when that is what she’s been taught to think all her life? South Africa and the United States have taken commendable, if long-overdue, strides in overcoming formalized racism in our constitutions and legal codes. It’s time we matched that commitment to “equal rights for all” with a similar commitment to rooting out the still more stubborn and insidious informal racisms that pervade modern society. I really like this post. I think it speaks to the heart of the socialization that leads to racism. You may enjoy my blog, Rhymes and Reasons. It’s a series of interviews with hip-hop heads who discuss their lives in the context of a few songs that matter to them. Tends to focus on issues of racism, white privilege, sexism, sexual violence, etc. Please take a look.